I’ve been reading Dark Horse’s Buffy books since Season 8 launched a few years back. So this was the one DH title that I read for this column that I was already well versed in. The first thing I noticed was that the dialogue in this issue was slightly more grounded than in Issue #1. I think Joss Whedon may have gone a bit over the top with his cutesy dialogue at the party depicted in the first issue and new writer Andrew Chambliss has definitely dialed that back in issue 2. Actually, it’s very clear that at least for now, the entire series is more grounded than what we saw in Season 8. 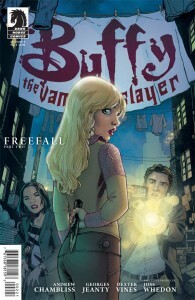 Buffy faces more of a threat from the police and financial problems than she does from demons. Of course, we know that’s going to change, and then there’s that issue of the possible OTHER slayer… You know… The male one. So far, so good. Honestly, Roy Thomas’ Conan here is far more fun than the mopey Conan from the recent movie. 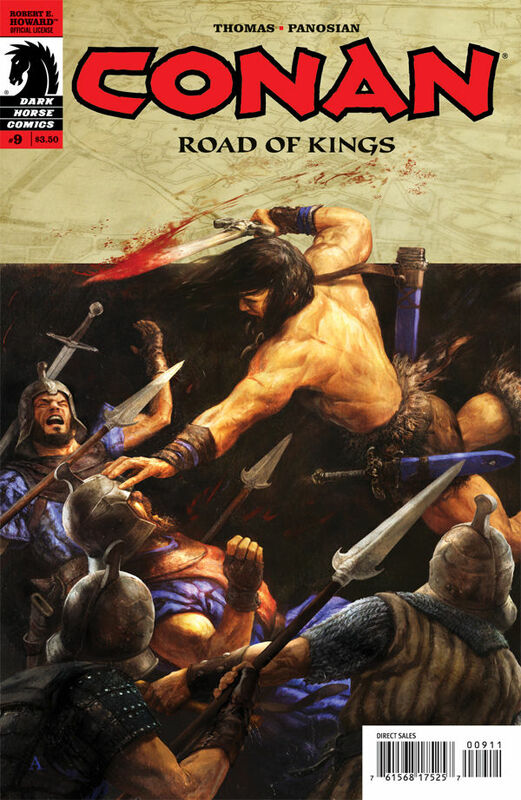 I have no idea what the Road of Kings is or how he ended up trapped in subterranean catacombs battling zombies with a priest and members of a royal family, but it doesn’t really feel like it even matters how he got there. Turns out Thomas’ version of Conan has a fear of wizardry. That was interesting to me as I always thought Conan was well-versed in battling the supernatural. Artist Dan Panosian handles the artwork well. 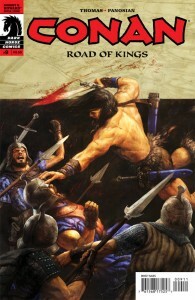 The action feels intense, Conan looks like Conan, and the zombies look like zombies. Can’t ask for much more than that from a Conan comic. I’m not particularly familiar with the BRPD beyond having seen the first Hellboy movie and read maybe two Hellboy trades. This issue, co-written by Mike Mignola and John Arcudi, introduced me to a handful of members of the BRPD who have been sent on a mission to Russia. It seems the Russians are dealing with strange issues involving the dead rising and demonic possession. Beyond not being familiar with the characters, I didn’t feel too lost regarding what was happening in this issue thanks to the summary text on the title page. Mignola and Arcudi present a compelling story salted with just the right amount of post-Cold War intrigue. Tyler Crooks art is pretty solid throughout, but really shines over the last four or five pages. Ok, so this is the title that I knew the least about going into reading it. Basically I chose it because I just liked the logo. It’s written by Rick Rememder, who has had a bit of recent success over at Marvel, and features the following disclaimer on the title page: “If you haven’t read the book up to this point, you shouldn’t read this issue.” Come on now, that just sounds like a challenge! So I read it and… Yeah, I have no idea who anyone was or what was real and what was maybe simulated. I probably should have heeded that warning. The book flashes between a family’s everyday struggles in our present to a spaceman fighting crazy cyborgs and aliens just moments before the big bang. Even though I couldn’t tell you who Annie is, or if she’s different from Char, I still kind of enjoyed the book enough that I might go hunt down the trade to try to figure it all out. I definitely don’t recommend starting the series with this issue however. moving in the right direction. I’m just not sure any new single pamphlet comic is worth $3.50. That’s something you’ll have to answer for yourself.